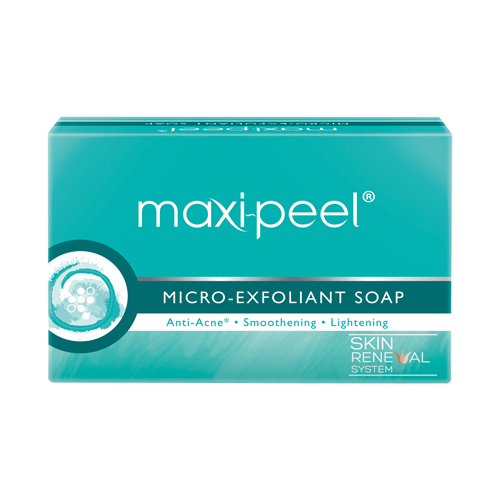 Maxi-Peel Exfoliant Soap is specifically designed to compliment exfoliating skin. It has Skin Renewal System that removes dead skin cells to reveal a blemish-free, smoother and whiter skin all over the body. • ANTI-ACNE: Contains salicylic acid to prevent body breakouts such as those on back, shoulders and chest • SMOOTHENING: Has micro-beads that gently massage your skin to remove dead skin cells • WHITENING: Evens out and whitens skin complexion in as fast as 5 to 7 days! Maxi-Peel Exfoliant Soap can be used for face and for body and is dermatologically-proven safe and effective. Directions for use: • Apply on skin during bathing and while washing the face. Leave for at least 1 minute. Wash and dry. • You may apply other complementary products after washing with Maxi-Peel Exfoliant Soap o Apply Maxi-Peel Sun Protection Cream during day time for added protection. o Apply Maxi-Peel Micro-Exfoliant Cream during night time to avoid too much dryness of the skin. FULL SIZES: 65g/ 90g/ 125g PRICE: PHP 25.00/ PHP 39.00/ PHP 53.00 AVAILABLE AT: Available in all leading supermarkets, drugstores, and groceries nationwide. SOCIAL MEDIA: Facebook: Maxi-Peel Instagram: @officialmaxipeel YouTube: Maxi-Peel Philippines Grab yours now at Sample Room!